Anne of Green Gables is the much loved novel by Canadian author Lucy Maud Montgomery in 1908. 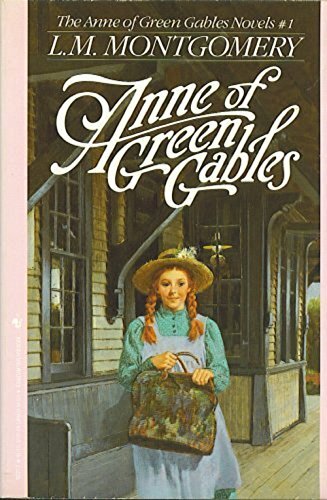 It recounts the adventures of Anne Shirley, an 11-year-old orphan girl who is mistakenly sent to Matthew and Marilla Cuthbert, a middle-aged brother and sister who had intended to adopt a boy to help them on their farm in Price Edward Island. The novel recounts how Anne makes her way with the Cuthberts, in school, and within the town. Lucy Maud Montgomery (1874-1942), was a Canadian author best known for a series of novels beginning in 1908 with Anne of Green Gables. The book was an immediate success and the central character, Anne, an orphaned girl, made Montgomery famous in her lifetime and gave her an international following. The first novel was followed by a series of sequels with Anne as the central character. This series was one of my childhood favorites, and lately, I've seen it making the blogging rounds and had a need to reread it. I flew through it, yet, I savored it. It took me back to my own adolescence when my love for Green Gables first came about. I love it as much today as I did 30+ years ago. Anne Shirley is always on the hunt for kindred spirits and yet, anyone who reads this book instantly becomes one. You love her quirky, imaginative ways. You love the unconditional love that Marilla and Matthew give her. You cry when someone important passes away in the story... at least, I do every time I read it. You really get pulled right into Avonlea! For those who have read it, can empathize. Those who haven't read the book... what are you waiting for? It's epic!!! And to think it was written in 1908. It doesn't feel like it though. Yup, I'll always love this book. **This book is owned.Opinions are owned by Freda's Voice. Compensation may be earned from the links within. I'll have to reread this! I keep seeing it around too. Glad it was as good the second time around.